Patrick reporting for duty. This recipe was inspired by another of similar style in the Sunday Times Style magazine way back in 2011, though I’ve played around with it quite a bit. 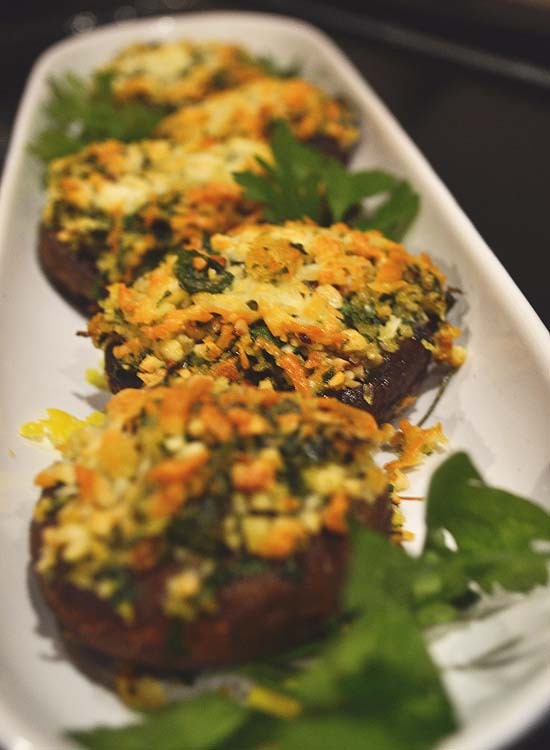 Stuffed mushrooms are packed full of flavour. While I was a vegetarian for about three years they were always a joy to see take pride of place in a restaurant main. I still enjoy them after re-introducing meat into my diet and often can’t use them enough, they are one of my favourite vegetables. In this recipe, I’ve chosen to use large organic mushrooms, as opposed to Portobello mushrooms. You can use either, but the smaller ones are great as finger food with friends or as a canapé for a dinner party. They seem quite large when you buy them but once in the oven they tend to shrink quite a bit and are a perfect portion popped into your mouth. Using Portobello mushrooms for this would act as a great Sunday dinner side or as a starring role in a vegetarian main. 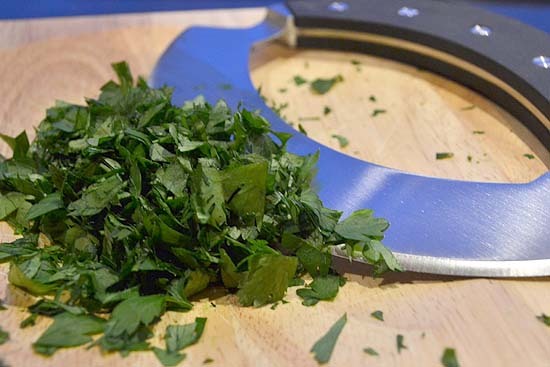 I love how the parsley is such a big part of this recipe, not only for the fact I got to use my new mezzaluna but because the parsley adds leafy, fresh bite. Many stuffed vegetable recipes come loaded with starchy, stodgy breadcrumbs whereas this is mildly bloat-inducing and very fresh tasting. Scrub any dirt off the mushrooms and pluck out the stems (save for stock or soup, or finely chop and add to the filling recipe later). Place them cap side up on a baking tray, lined with greaseproof paper and brush lightly with good quality olive oil. Finely chop the parsley and garlic. At this point, if you have a food processor, just use that to cut out the chopping steps. Toast the hazelnuts and chop finely. 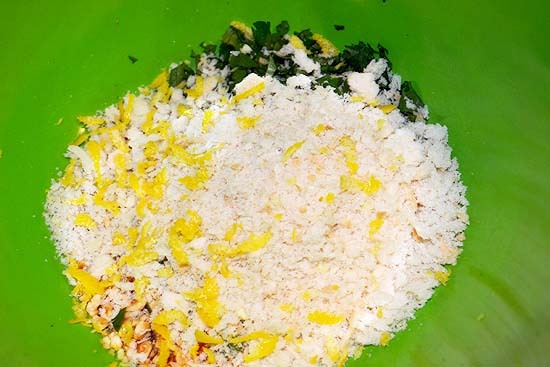 Grate both the lemon zest and the Pecorino, set aside 1/4 of the grated cheese. Combine all the chopped and grated ingredients in a large bowl, add 3 glugs of olive oil, 2 teaspoons of pepper and 1 teaspoon of paprika (I tend to go for unsmoked). You can add salt if you desire, though the Pecorino is very salty as it is. Spoon (or lob) the mixture onto the tops of the oiled mushrooms. 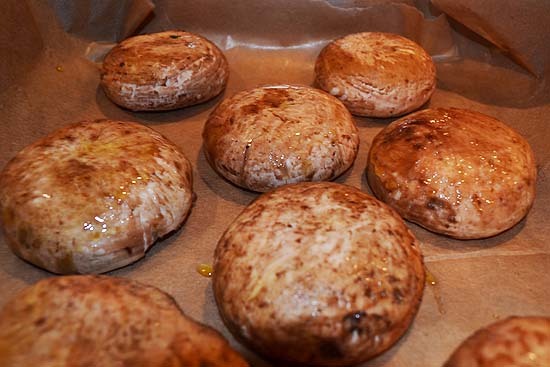 Finish with a sprinkling of the leftover Pecorino on each shroom and bake for 12 minutes in a 200°c oven. 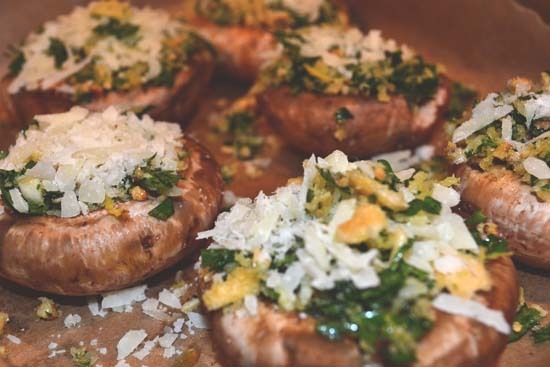 Drizzle with a little balsamic vinegar on each mushroom and plate up with tufts of parsley and shavings of lemon zest. This serves two and can stretch to four, but I would greedily gobble this all up on my own! Why not caramelise an onion and place a little onion on each mushroom before you put the topping on? It will add a sweet element to counteract the salty cheese. You could also use Parmesan in place of Pecorino, for it’s peppery, fruity and creamy taste as opposed to the salty bite here. Another idea would be to place a spoonful of cream cheese under the topping before baking if you wanted to make it a little more indulgent. Obviously, leave out the cheese to make this vegan.